Preheat the oven to 350°F. Lay the strips of bacon in a single layer on a baking rack and place the rack on a baking sheet. Bake until crispy, then drain the bacon on paper towels. Place the mayonnaise in a small mixing bowl. Finely chop 2 strips of the Hoffy Bacon and add it to the mayonnaise, stirring to combine well. 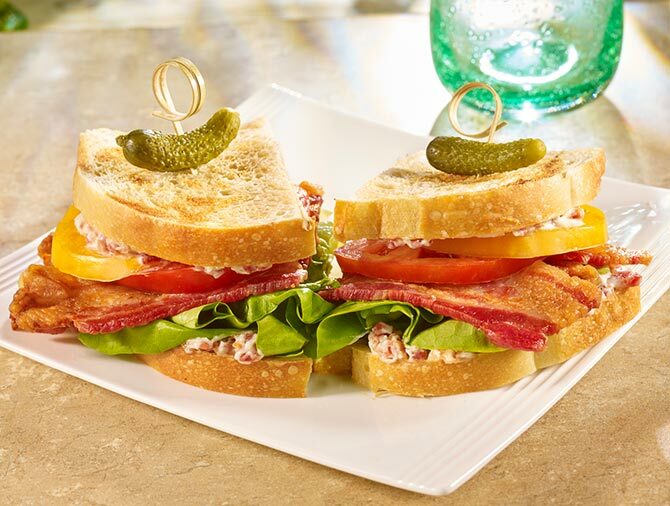 Toast the sourdough bread slices lightly and spread one side of all 4 slices with a thin layer of the Bacon Mayonnaise. Top two slices of the bread with two pieces of butter lettuce each. Pile three slices of tomatoes on the lettuce and season the tomatoes with salt and pepper. Top the tomatoes with three slices of crispy Hoffy bacon. Place the top slice of bread on top of each sandwich and cut the sandwiches in half.